Shopmobility is based at Sainsbury’s Supermarket on Garratt Lane, SW18, opposite the fantastic Southside Shopping Centre and is convenient for the whole of Wandsworth Town Centre. This is a service for people with mobility issues and pensioners. The Shopmobility Service is provided by Wandsworth Community Transport (WCT) and it runs in conjunction with the WCT shopping shuttle. 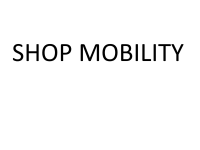 It enables people to be picked up by the shuttle service, be dropped off at the Shopmobility office, and then pick up a mobility aid to go and do their shopping or visit the town centre. wheelchairs for sale that can also be rented out at reasonable prices per day/week/month. Shopmobility is based at the exit of Sainsbury's Supermarket car park on Garratt Lane, SW18, opposite Southside Shopping Centre. Loans of mobility aids are free of charge. There is a £2.50 charge for the WCT shuttle service for those who require transport to Shopmobility. To use this service you can apply yourself or on your child's behalf.